Mr. P and I always pick up a Christmas ornament on our travels. We had a really fun time collecting them this year. Sometimes they are actual Christmas ornaments, sometimes they’re keychains or tchotchkes I attach a hook to. 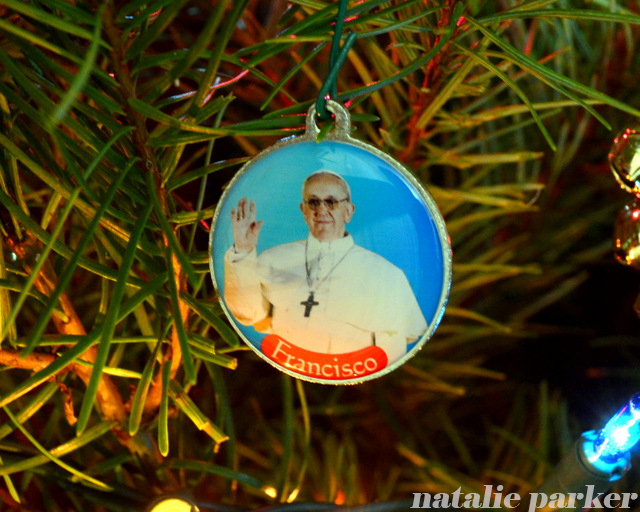 This year we’re trending more toward actual ornaments! Ireland: Guinness Christmas Tree. Yes we bought this during the crazy-merchandised Guinness visit that I didn’t love. Yes, we overpaid for it. But how can you resist a gold tree made out of harps and little pints? That’s right, you can’t. Munich: Snowflake, Penguin, Christmas Scene. This was last year technically. 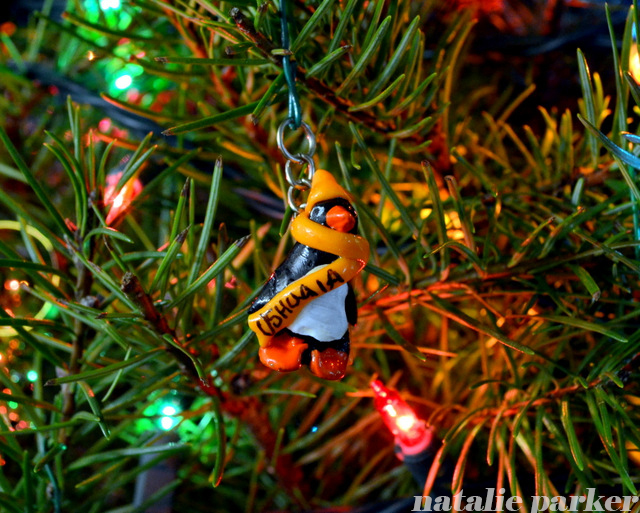 But since we were traveling for Christmas, we didn’t get a chance to hang these on our own tree until this year. And since we were visiting the Munich Christmas Markets, ummmm, several ornaments were purchased. Several. Italy: Venetian Carnenvale Mask. I popped into a carnevale mask store to buy a souvenir for a friend of mine and ended up walking out with a Christmas ornament for myself. The shop owner let me pick out a mask and then turned it into an ornament. Austria: Keychain. Super touristy, yep. The poor shopkeeper seemed a bit miffed that we didn’t want one of the huge hand painted ornaments. Since I already had a generic Christmas scene painted on an ornament (see above), I wanted something that said “Austria” a bit more. The keychain has a bunch of the major Innsbruck sites, plus an edelweiss! I was sold. 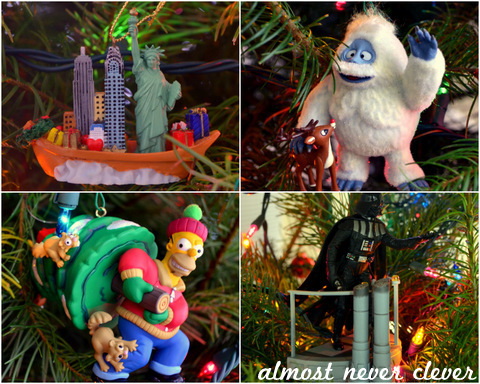 See past travel ornaments here: 2014, 2013, 2012, 2011. 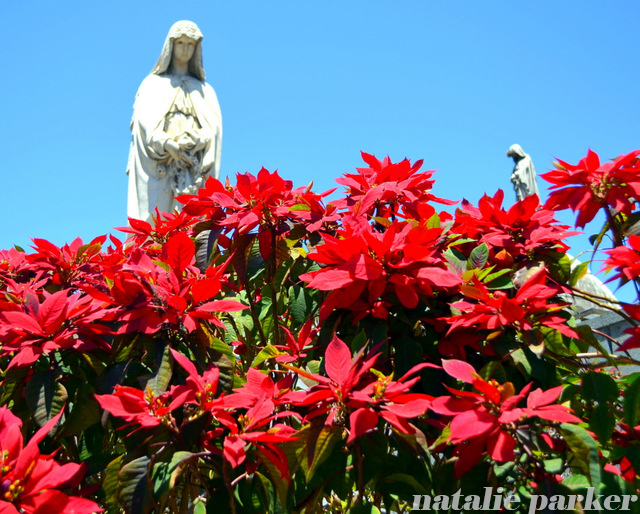 I’m not one to visit cemeteries on trips even if they are tourist attractions and famous people are buried there. But a friend of ours who was traveling with us to Argentina and Antarctica was very into it, so Mr. P and I went along to El Cementerio de la Recoleta. We were about done with our visit. On our way out, we passed this huge poinsettia bush. I never realized before that I’d never seen a pointsettia growing in the wild (or just not in a pot in a Walgreens or on an ESPN set during Christmas). I stopped to take many photos. It was our first time traveling during the Christmas season. I’d grown up with a Dad who had to work on Christmas Eve and open a store early on the day after Christmas, so any traveling in December, much less in the southern hemisphere, was odd. It was such an oppressively hot day but it finally felt a tiny bit like Christmastime. Merry Christmas everyone! 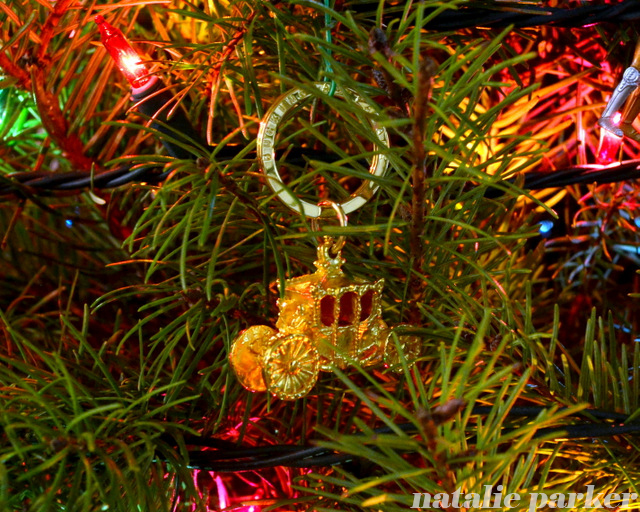 Oh my, I have lots of new travel ornaments to share with you this year! We try and pick up an ornament for our tree during our travels. 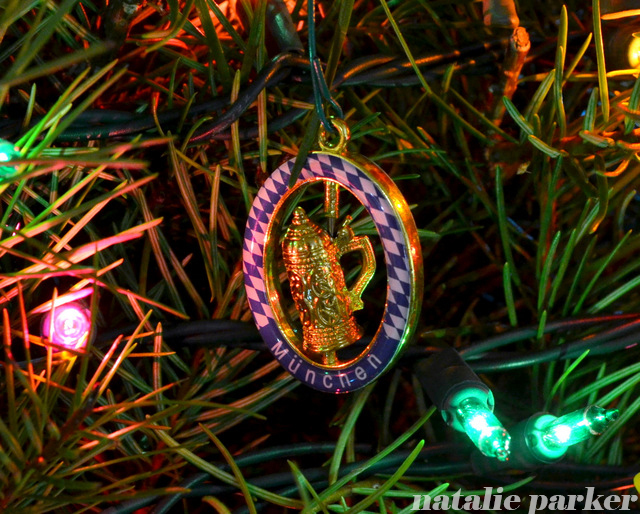 It doesn’t have to be made as an ornament — many of the best ones we have are converted keychains. 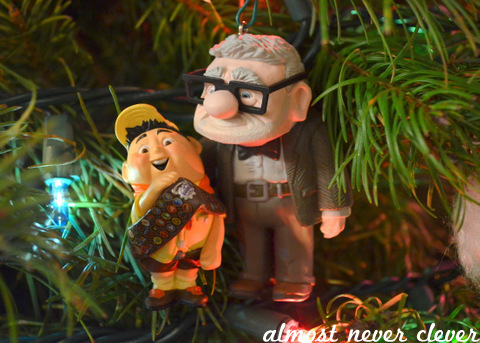 Putting these up is my favorite part of decorating the tree. 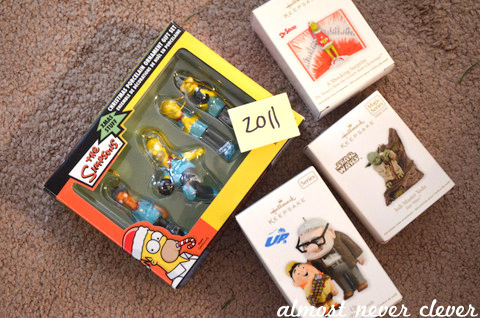 The first two are from 2013 — we were on our trip during Christmas so it’s the first time they’ve gone on the tree. The second four are from our big trip to Europe this fall. The Ushuaia Penguin. We didn’t make it to any of the gift shops on Antarctica (seriously, there are gift shops at some research stations) so this little penguin from Ushuaia was the next best thing. So stinking cute. Pope Francis. Pope Francis is Argentine and I could. not. wait. to see some Pope paraphernalia in Argentina. This is a keychain that has a picture of the Vatican on the back. Coach from Buckingham Palace. 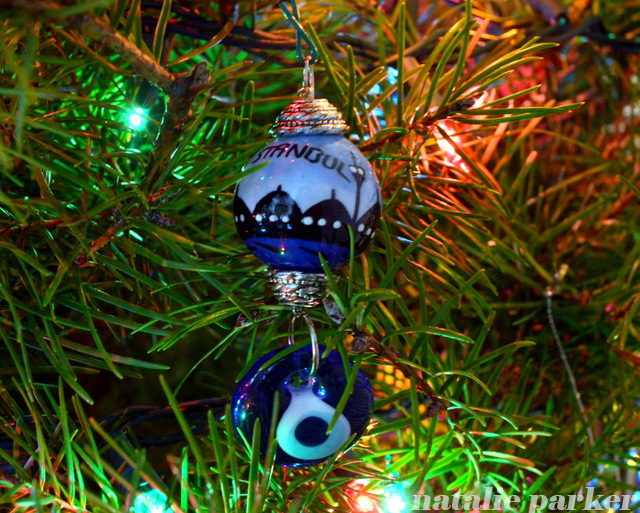 Yes, we already have an ornament from London and no, I generally don’t get a new one every time I revisit a city. But we were in Buckingham Palace (the gift shop, but inside the palace walls). I saw it, had to have it. The end. Munich Beer Stein. Another keychain, picked up at Oktoberfest. I don’t feel like I need to describe the awesomeness of this one. Istanbul Eye. We had a hard time finding something we liked in Istanbul. This keychain has a bit of the city plus a charm to ward off the evil eye (frequently seen on our trip). Brussels Lace. Brussels is very famous for its lace. This ornament isn’t on the level of some of the amazing work we saw, but it was cute and reminds us of the trip, which is the entire point. Previously: 2011 – Camel from Egypt, 2012 – Great Wall from China & Double Decker from London, 2013 – Kangaroo from Australia. 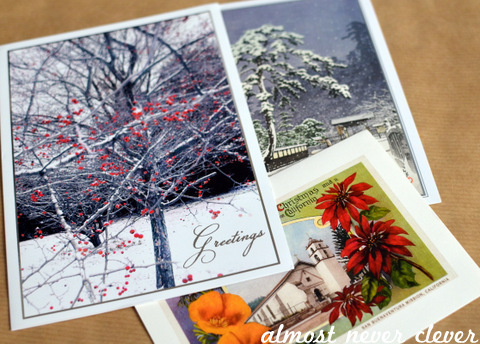 Our 2014 Christmas cards are making their way to their destinations and I’m sharing them with you today! 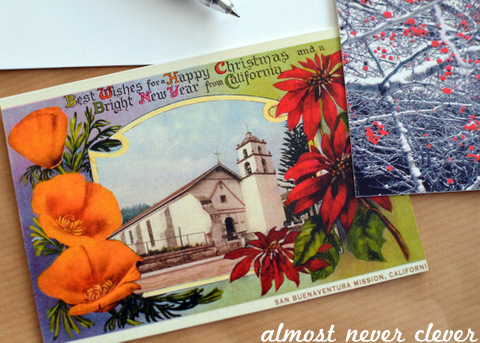 As per usual, this crafty design-loving cardaholic buys rather than makes Christmas cards. 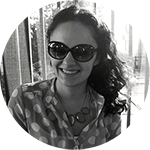 More on why here. 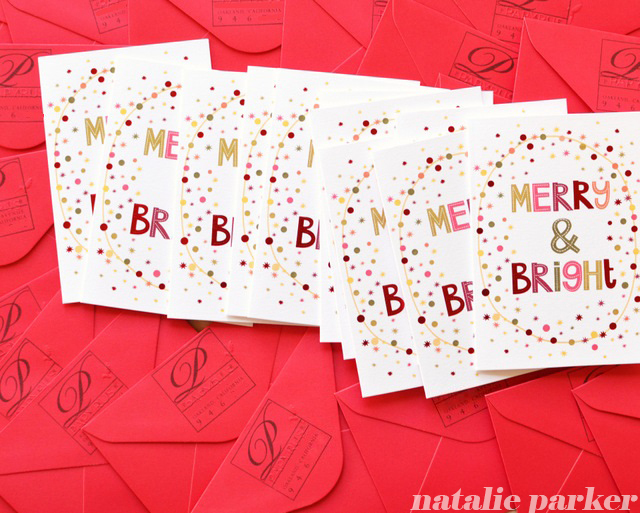 This is one of the few times I prefer quantity over quality: I’d rather spread the love and send more cards than spend the time to make them for fewer people. 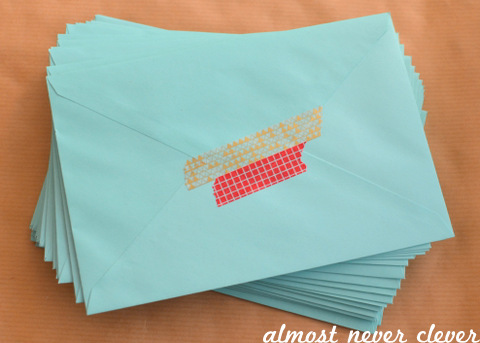 I’m still keeping up with my always-send-a-card mantra, so I had about 90 on our list. I bought these at Papyrus a few weeks ago. Normally I shop the after Christmas sales, but we were on a boat heading home from Antarctica last year. No after Christmas sales there, I’m afraid. 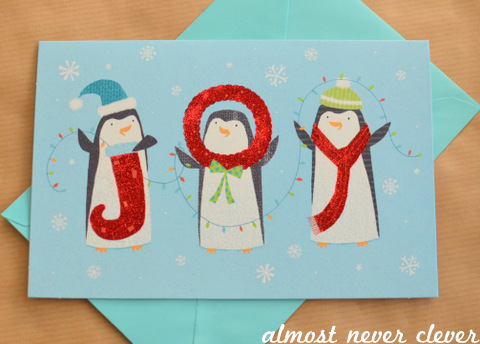 These cards are extra awesome because the envelopes have this cool festive design on the front! I stamped the back with my trusty return address stamp from Paper Source. In other news, I’m in love with the Postal Service’s Rudolph stamps. Love. I wish I could get a sheet of just Bumbles though. 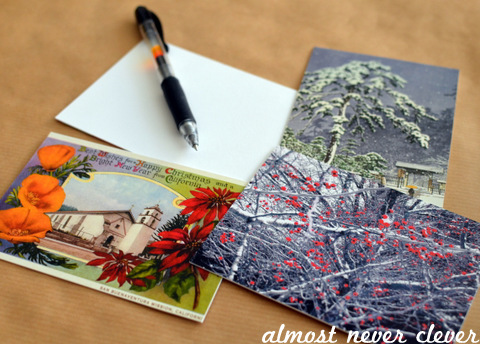 Did you know that the Postal Service makes holiday-themed international stamps? My list of international cards gets a tiny bit bigger every year and I love these rad round stamps! Hope it’s getting merry and bright in your neck of the woods! 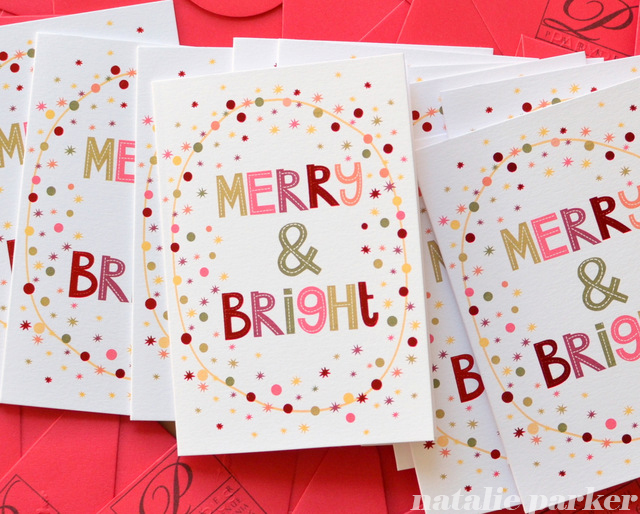 And if you’re looking for ways to upcycle old cards, make sure to check out my tutorials on making Christmas card gift tags and Christmas card notecards! It’s the day after Christmas! What does one do with all of those Christmas and holiday cards? I’m always looking for neat ways to reuse them. I turn some of the cards into next year’s gift tags. Other cards have such pretty pictures that I want to reuse the whole thing! The solution? I turn them into notecards! 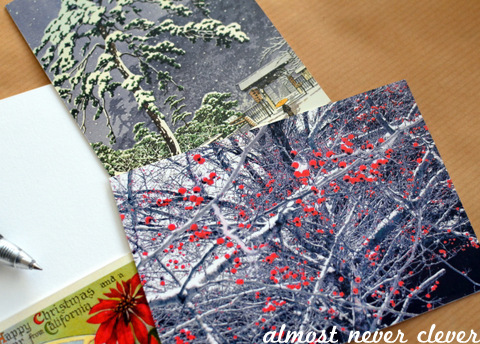 I pick my favorites and use my recycled notecard tutorial to turn them into new cards. I use leftover response cards from my wedding as the base layer for these new notecards, but you can use any heavy stock you have on hand. Craft paper would work really well here! I have this nice set of cards ready for next year in case I need to send a note to someone during the holidays. Easy! 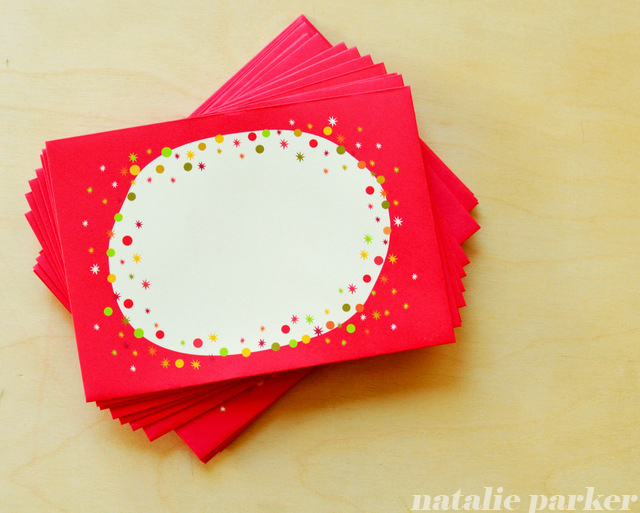 Earlier: How to make recycled notecards, even more recycled notecards. 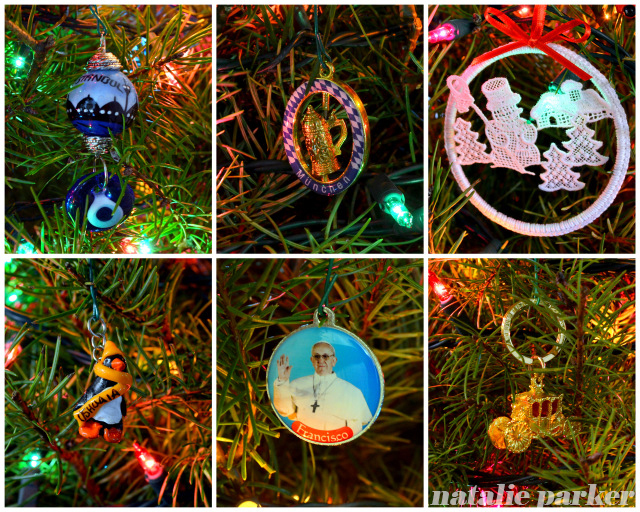 I’m still plugging along getting pictures of all our Christmas ornaments! See that Statue of Liberty ornament? I bought that on the New York trip that I just finished scrapbooking! The result? 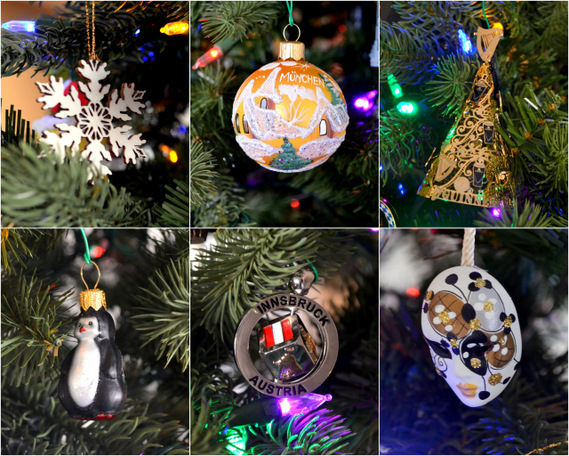 I can make cool layouts like the one below, showing what new ornaments we got for our tree each year. 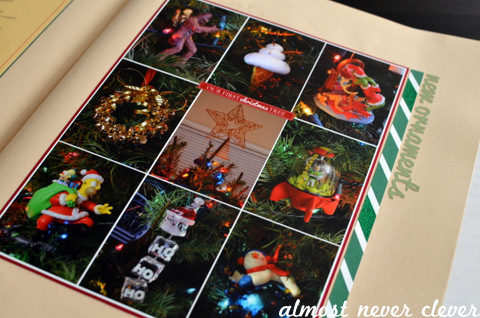 Yep, the ornament photos on that layout were taken 8 years after they were purchased. Does it even matter? I don’t think so. I’m hoping I’m completely caught up by next year! 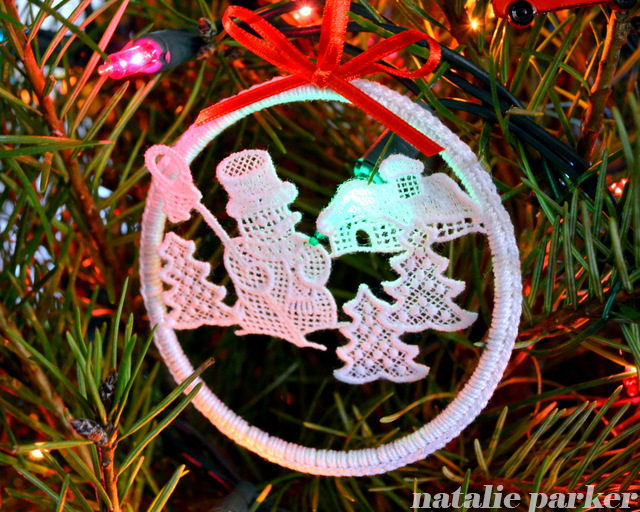 For more information on my ornament/picture process, click here! As usual, we bought these on sale last year*. And as usual, I bow in respect to those that make their own cards. Making my own cards just isn’t in the cards for me. Ha! 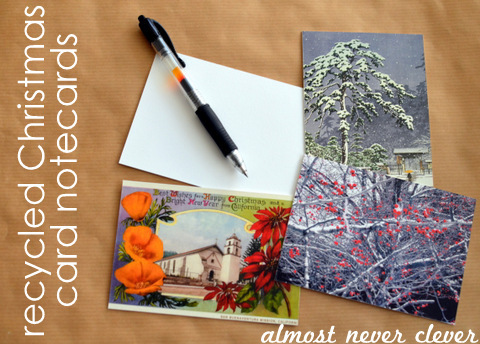 Keeping with my resolution of sending more cards, any “maybes” on my list were “yeses.” Everyone deserves holiday wishes and I tried to sit and think of the person while I was writing each card. 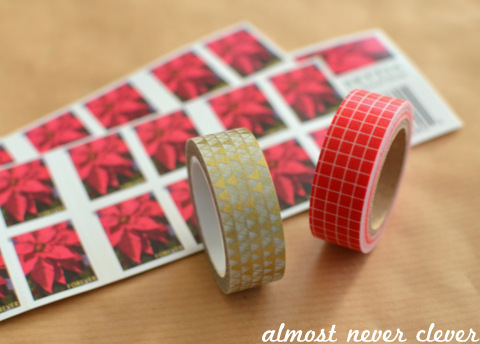 I dressed up the envelopes with two different types of washi tape I got from Two Peas (gold triangles, red grid). I used my personal stamp from Paper Source that I still have an unhealthy obsession with admiration for. I had to get these out earlier than normal this year. I’m glad I get to share them with you! *Mr. P insisted on penguins this year. I love the cards but the envelopes were a tad flimsy for my liking. I kept on telling him that I might end up like Susan from Seinfeld after licking all of the envelopes.